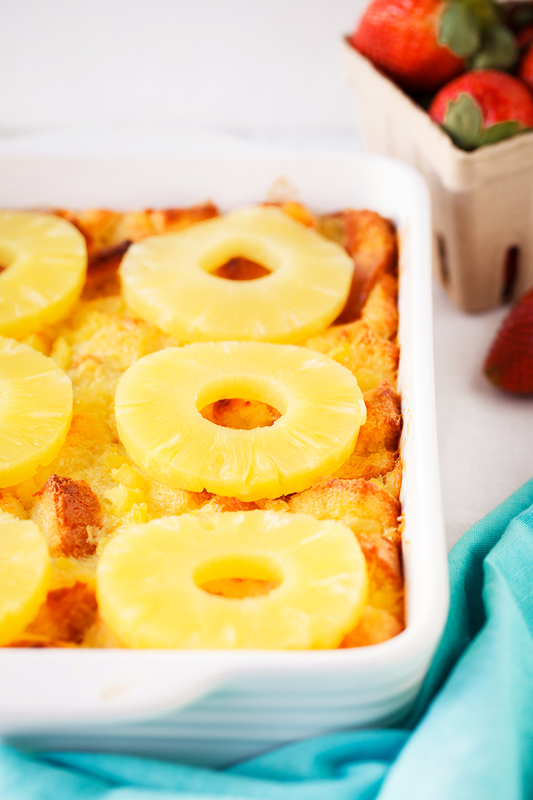 Pineapple Stuffing: a delicious side dish for any gathering! Perfect for Easter or Thanksgiving dinner. Serve with ham and green beans for a delicious lunch. 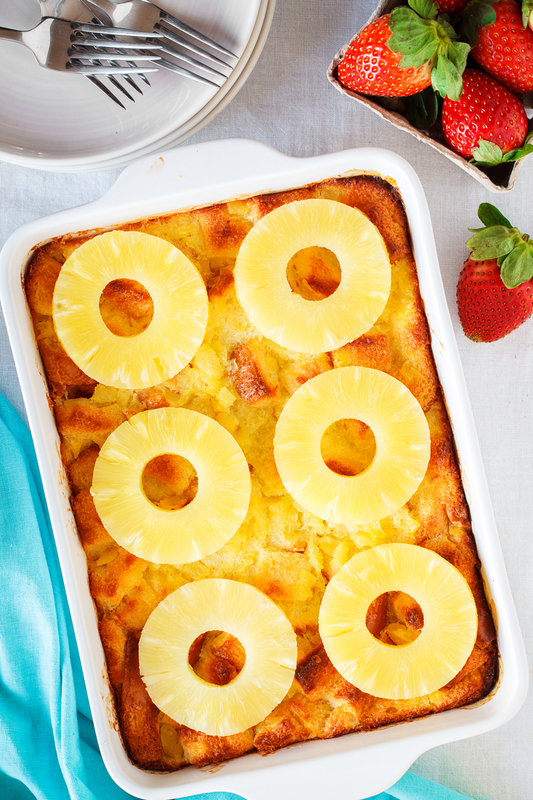 My husband isn’t a fan of “overly” sweet things, but what he think is too sweet is perfect for me 🙂 However, when it comes to this pineapple stuffing we both agree this is a tasty side dish perfect for your Easter dinner. While this pineapple stuffing is delicious all year round it tends to be an Easter dinner staple because it pairs perfectly with a salty ham and green bean casserole. The top of this pineapple stuffing gets a light golden color with a slight crisp. Crisp on the outside and soft and bursting with flavor on the inside. 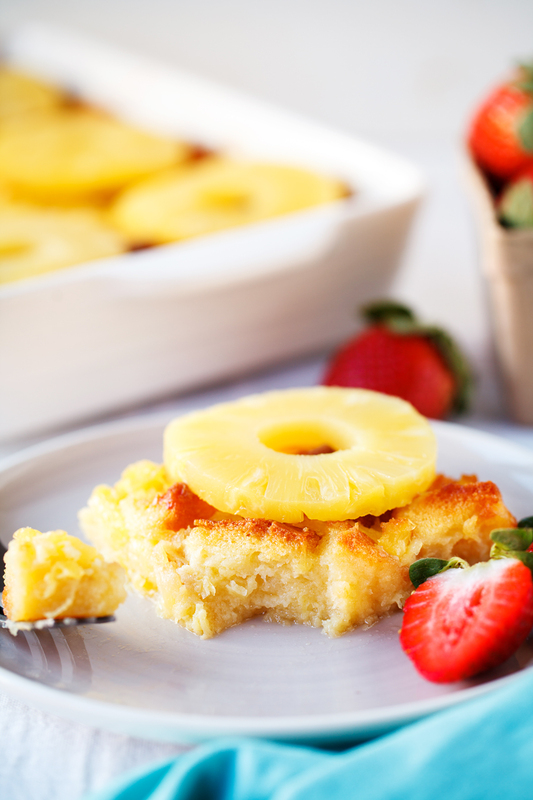 The canned pineapple makes this an easy and quick casserole which is great when serving a crowd. My kids always look forward to Easter dinner at their Nana’s house. The day is full of good food, an Easter egg hunt, decorating Easter eggs, a fun time playing games with the family, and of course most importantly celebrating the resurrection of our Lord Jesus Christ. Mix together, with electric mixture, butter and sugar until well blended. 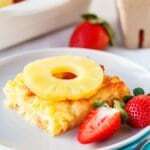 Add pineapple, milk and bread cubes and mix until combined. Place in greased baking pan. I like to use a 9x 13 inch pan. Your size pan may determine how long you need to bake. Bake at 350 degrees for 1 hour or until center is hot. Do you have certain dishes that seem to be a staple at your Easter dinner table? I hope you give this pineapple stuffing a chance to become a new family favorite! If you do make this delicious dish please tag me @madetobeamomma on all social media platforms–I love to see what your are cooking! Can this sit overnight in the fridge and be baked in the morning? Hi Jasmine, I have never personally tried it that way but I think that would work out just fine! 🙂 If you give it a try let me know how it goes! This looks yummy, but I have a few questions. How do you mix in the butter? Do you cut it up and stir it in? And the eggs… how do you mix those in? That makes sense. Can’t wait to try it. Thanks! YUM!! This looks SO easy and delicious! Oh! This sounds and looks so delicious. Oh wow!! This sounds absolutely amazing!! I can’t wait to try this! This sounds like this would be perfect for brunch! 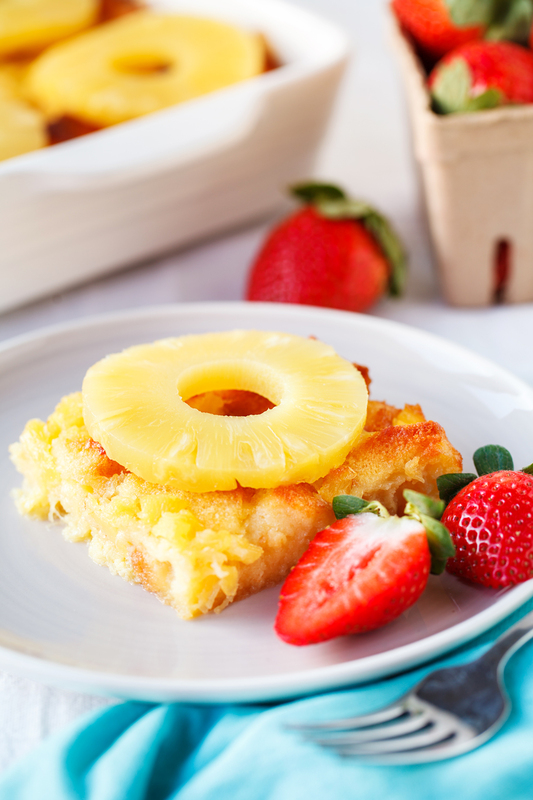 I love anything with pineapple and this is no exception; so excited to make this! What size can of crushed pineapple do you use ?